The Spice Club Turns Four! Autumn 2010. I gingerly approached my Mum to ask whether she would be party to inviting complete strangers into our home for a 5-course dinner. Her astonishment was only surpassed by the certainty of her monosyllabic response, “No!”. However, after some (much) gentle (loud) persuasion (kicking and screaming), I convinced her otherwise (she reluctantly gave-in). Having never attended a supper-club before, and with it being a complete novelty in Manchester, I eagerly (and blindly) set about preparing for what was The Spice Club’s debut event – 8 guests, half of whom were friends, the other half online strangers. Perhaps it was naive passion, or a flight of fancy, but success fed my perseverance in a bid to deliver an authentic home-style dining experience for our kind patrons. Four years on, The Spice Club has grown and diversified. We now run cookery classes (private, group and corporate) where we teach all: from those who don’t know the difference between a chapati and a samosa, to chef protégés, the tricks and skills to turn-out Indian food the way it should be – home cooked and delicious! We host pop up restaurants, whereby we transform empty event or bar spaces throughout Manchester into The Spice Club’s new home for “one-night only”. 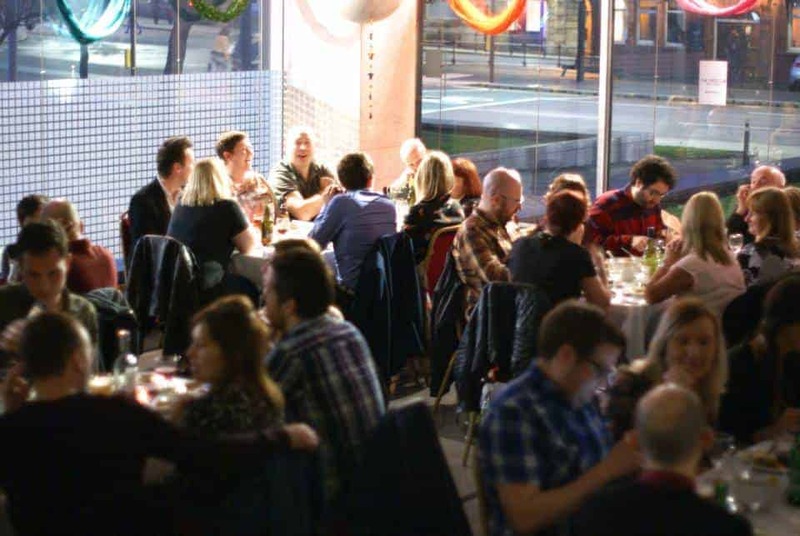 These exciting ventures have allowed us to explore Manchester and serve an eclectic fan-base from Spinningfields to the Green Quarter, with our biggest supper club recently hosting 64 diners in the Northern Quarter. A Spinningfields pop-up street food event, and The Friday Food Fight 2013, allowed us to cut the shackles and call on our naughty memories to deliver the lesser known delights of authentic Indian Street food. Yet, our finesse and technical skills were showcased to widespread acclaim when invited to host a night at the multi award winning Freemasons as Wiswell during the week of celebration of British Game. It is both enthralling and humbling to reflect on a very evocative journey. Nevertheless, the signature of The Spice Club remains giving patrons a taste of a little-known India – food and hospitality you would only get at home. Last Saturday we celebrated our fourth birthday at the effortlessly cool cafe-bar that is “Redbank Co”. It was another wonderful evening for us – an evening that was a testament to the progress The Spice Club has made, and a mirror to how it all began… with all of you… and it is with great humility I extend my heartfelt gratitude to you, who have made it possible. My Mum was there at the Redbank, as she was on day 1, my rock and my inspiration… my dreams would not have been realised without you. I’ve posted a few snaps* of our celebrations below but you can use the full album of photos here. Enjoy and I hope to see you at The Spice Club very soon!